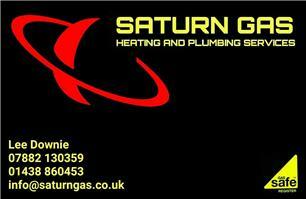 Saturn Gas Heating & Plumbing Services - Central Heating Engineer, Plumber based in Walkern, Hertfordshire. We are a local business with 10 years experience. We specialise in all aspects of heating and plumbing services including boiler installations, servicing and break downs, pressurised systems, landlord certificates, power flushes, full heating installations, radiator replacements, cylinders, leak detection, electrical issues, bathroom installations and all general plumbing works. For a free no obligation quotation please contact us at [email protected] or call Lee on 07882130359. All works guaranteed and fully insured.